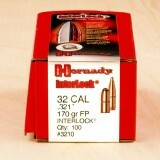 Hornady's InterLock line of bullets feature exposed lead tips that give shooters controlled expansion. 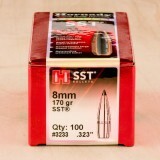 Each projectile in this box of 100 is .321" in diameter and weighs 170 grains. 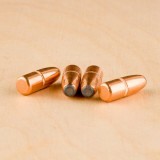 These bullets exhibit a raised ring inside the copper jacket that is embedded into the lead core. 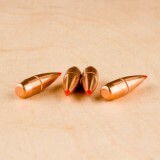 This ring keeps the jacket and core fused together so the bullet retains mass and displays deep penetration as it expands. These projectiles have a secant ogive profile which allows for a high ballistic coefficient while retaining the optimum bearing surface for stable flight. 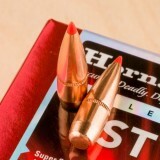 Hornady has earned a reputation for providing shooters and hunters with high quality, reliable products. 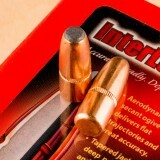 Measured all bullets with comparator. All came in +/_ .001" . The most consistent I've ever had. Shot sub M.O.A. at 200 yes through an old Mauser 98K.